You’ve been asking for it and we have delivered! Digital PTO is super excited to announce our newest feature available to Premium and Premium Plus Members: Automatic Email Newsletter Blasts! It can’t get a whole lot easier than this. Set up your general settings (colors, optional logo, delivery options), import your current subscribers, turn on the subscription widget for new subscribers and save. You’re done! 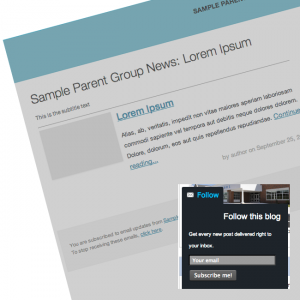 There is NOTHING more you need to do to send out automatic email newsletters to your community! As soon as you post your next batch of news articles to your website, our magical servers will compile the information, put it all into a nice email and send it out to everyone on your list! It’s so simple, it’s almost absurd. Setting up your email settings can’t be a whole lot faster. We will walk you through the entire process in our Help Center. You’ll specify what email address you want the newsletters sent from, pick out your school colors, upload an optional logo and set up your delivery options. You can choose to have an email sent immediately after you post a news article, you can choose to have a daily email summary of the days latest news, or you can opt to send out a weekly summary of your news (you get to pick the day too!). Then just sit back and watch it all happen. Import Current Subscribers & Allow Sign Up’s for More. If you are using Digital PTO’s Online Family Registration forms, you can import your current list into your email blast list with a few clicks. You can also upload any other spread sheet of email addresses you have from offline registrations. We also provide you with a fancy widget that adds a “Follow” button to the bottom of every page on your website and new users can sign up with their email addresses instantly. If you are ready to activate the new Automatic Email Newsletter Blasts on your website, please visit our Training Document in the Help Center and it will walk you through each step to get you up and running in just a few minutes! We’re excited to hear your feedback on this newest Digital PTO feature. We hope you are as excited as we are about it. This is just one more way that Digital PTO is helping your Parent Group communicate with your communities with more professional ease. Enjoy the new feature and please let us know what you think! Not a Premium Plan Member? Upgrade Today!